Vice Versa is a clock which only has hands. It is designed by Yiran Qian from China and was a shortlisted entry for the brightLED competition. As can be seen, the hands rotate around an axis like any other clock, but the numbers are built from LED’s on the end of the hands which gives them the appearance of being stationary as the hands move around. However, the clock is currently concept although it would be cool if it was actually built. Slan LED watches are simple but look great. They do the basic functions a watch should do ie. Tell the time and date. The displays are large and made from coloured LED’s which shine fairly bright. The back of the watches are stainless steel and the strap is leather. The watches can go around 165 feet under water and cost around $100 depending on the model you get. The Cect W100 is a wrist watch with built in GSM on the 900/1800MHz range. This allows it to be used as a phone. It is built by Qiao Xing Mobile Communications Co Ltd and is fully packed with features. 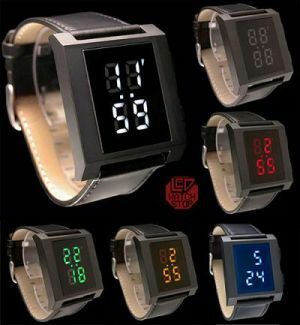 As well as being able to make phone calls the watch can play MP3 music or show 3GP and MP4 movies. As well as the audio and video capabilities there is a camera built in which has a resolution of 640 x 480 pixels. Talk time is around 3 – 4 hours with about 200 – 280 hours of standby time. SMS and MMS messages can be sent/received and calls can either make the watch ring or vibrate. Ring tones are fully customisable too with the ability to play MP3 or MP4’s. The screen it touch screen which allows you to either write on the face of the watch or tap the screen for dialing. Memory wise, the watch phone supports up to 2GB on a MicroSD card. That’s a crazy amount of features just there with others such as Bluetooth, Alarms, calculator, graphics editor, memos, calendar, stopwatch and a few more. The Nixie tube wrist watch is fairly simple in operation in that you press a button to illuminate the Nixie Tubes. It runs by a AA battery which can power the watch for 6 months if the time is viewed about a dozen times a day. Only 25 of these beautys were ever made. 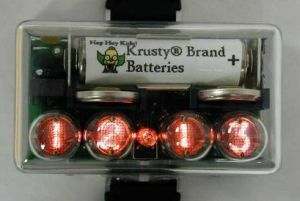 Time is kept by 2 watch type batteries which last around 6 months and are independent of the Nixie Tubes. It measures 2.75 x 1.5 x 1.2 inches and the tubes have a soft orange glow which the original Nixie Tubes had. With a water powered alarm clock running on H2O, you have no worries about batteries running flat or the power going out. As long as you have a bit of water you will be able to wake up on time. The clocks sell for around $15 and are quite simple by design, but they do what they say. Each clock will last around 2 – 3 months on one top up. 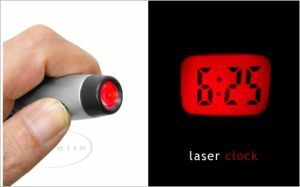 When laser pens started becoming popular several years ago they were the thing to have. I remember getting one for 3 quid in Paris and it could project different shapes on to the wall depending what tiny lens was screwed on to the end of it. Now they have just introduced the Laser Clock which projects the actual time on to any surface. 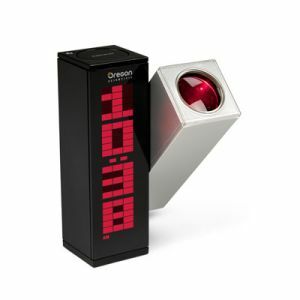 I have to admit that I do not know if its actually a laser clock, or just a bright red LED… either way its kind of cool. You can pick one of the Laser Clocks up from Dynamism for $29.99. The Font Clock has 12 different font with which it can tell the time. The inside mechanisms are set to display random, mixed up displays of time in different fonts. I wonder if they have windings in there… that would make for a cool excuse why you were late for work (not being able to tell the time). Three sizes of the clock are available which are the G270 which measures 47.6 x 16.2 x 56.6 CM and this one displays the time, date and day of the week. The next size is the G225 which is slightly smaller measuring 42.2 x 11.8 x 31.8 CM and shows just the time and date. 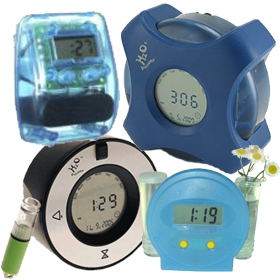 The smallest clock is the G100 which measures 29 x 11 x 14 CM and displays the time only. Costing a hefty 810 GBP (about $1600) for the large version, I think I will be giving this one a miss. 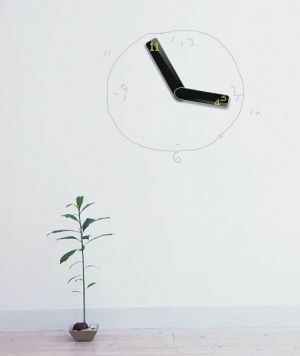 The clocks are available from thorstenvanelten. From Rayna Creations comes this compact triple weekly, battery powered, alarm clock. What it means by triple weekly is that you have the option of pre setting the alarm clock for weekdays, Saturdays and Sundays individually. With your average alarm clock you need to manually adjust the alarm setting each time your routine changes, this beauty avoids such annoyance. For me on a personal level I am known to forget to change the settings and either wake the household up, or arrive late for appointments. On the outset it is quite basic looking, but what more do you need? If you are just looking for something that will do its job then this really does suit your needs every day of the week. The rest of the review is after the jump. 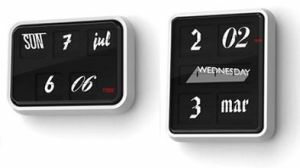 Widgetstation is a stand alone device which it more advanced then other desk clocks and calendars you have seen before. It connects to your PC via wifi, ethernet or USB. Once connected to your PC the device can receive information and display it on one of it’s two screens. 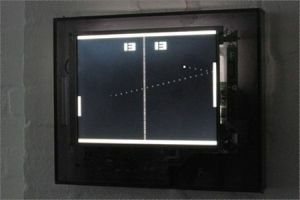 On the left is a mono LCD screen and on the right a colour LCD screen. Standard widgets included are able to display clocks, calendars, weather reports and anything you really want. What makes this possible is the ability to make custom widgets to use on the device, and it is also possible to display these widgets with other users. To download a new widget you need to use the widget engine which is provided as part of the service. Projection clocks are kind of funky. They project the time on to the roof as you lay back in bed and think “wow thats cool”. Along comes the Batman projection clock which now projects the bat signal on to your ceiling. Just make sure you remind yourself that you are not batman and you do not need to jump up and get dressed every time the signal hits the ceiling. 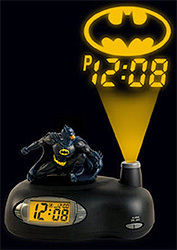 The clock is powered by a AA battery and also has a moulded figure of batman him self to keep you safe. The face of the clock is a black smooth surface which shows the time and temperature and ads to the sleekness of the clock. It costs $89.95 and is available from Oregon Scientific. If any of you have ordered one of the $285.85 Pong Clocks then they are starting to ship. The Pong Clock just sits on your wall playing Pong while telling the time some how 🙂 Great for childhood memories.